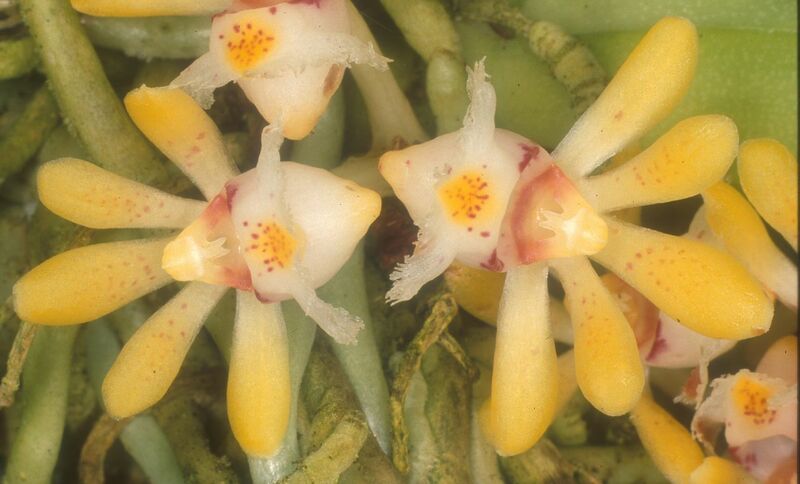 Found in Assam, eastern Himalayas, Nepal, Bhutan, Sikkim, Thailand, Laos, and Vietnam at elevations of 300 to 1000 meters as a small sized, pendant, warm to hot growing, monopodial epiphyte with very short stems carrying ovate-oblong, acute, obliquely bidentate apically leaves that blooms in the fall and winter on a 3 to 6" [7 to 12 cm] long, corymbose inflorescence that has ovate bracts and several [5 to 10], simultaneously opening flowers. This humidity loving species needs hot to warm temperatures, year round watering, fertilizer and bright indirect light. Mount it on a branch or on tree fern.